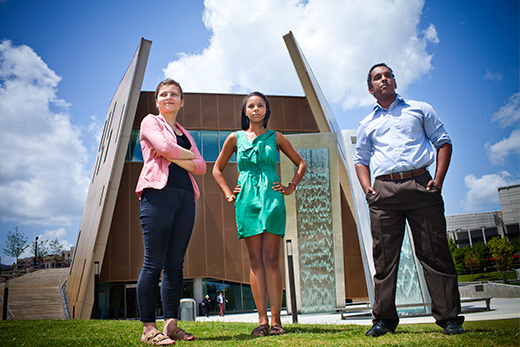 Three Emory students have been selected to receive the John Lewis Fellowship, a new human-rights focused educational program launched in partnership with the National Center for Civil and Human Rights (NCCHR) and Humanity in Action (HIA), Inc., an international educational organization. Students and recent graduates from 119 universities applied for the new fellowship — named for civil rights icon U.S. Rep. John Lewis — which brings an inaugural class of 20 American and 10 European scholars to Atlanta this summer for a four-week program that explores the history and contemporary politics of diversity and minority rights in the United States. • Lamija Grbic 17C — Born in Germany after her parents emigrated from Bosnia and Herzegovina, Grbic is a rising junior majoring in sociology and philosophy. She tutors at the Emory Writing Center, volunteered at Freedom University and is a member of Freedom at Emory, which advocates for educational rights of undocumented students. • Mahamed Omar 16C — Born in Kenya and raised in the U.S., Omar is a rising senior pursuing a major in political science and a minor in economics. He has worked with many campus groups, including the Young Democrats and Feminists in Action. He is also a member of Freedom at Emory and Strong Returns, which is working to make prison reform a top issue in the 2016 election. • Erica Sterling 15C — A Class of 2015 graduate, Sterling pursued a dual major in history and psychology while serving as a staff member of the student-run community service organization Volunteer Emory. A Mellon Mays Undergraduate Fellow and Fox Center Undergraduate Humanities Honors Fellow, Sterling conducts research for the Georgia Civil Rights Cold Case Project. Hosted by the NCCHR, the program got under way July 5 and focuses on civil and human rights, race and racism, immigration and national identity, and Native American issues. Directed by Atlanta historian Karcheik Sims-Alvarado, the program features site visits and daily lectures, discussions and seminars with renowned academics, journalists, politicians and activists. The program strives to "highlight different models of action to remedy injustice relating to diverse societies" and will culminate with the creation of action projects that address those issues in society, according an HIA news release. "Working in Atlanta with the National Center for Civil and Human Rights provides an extraordinary opportunity for a group of outstanding international emerging leaders to explore the most pressing issues of civil and human rights in the United States and Europe. The primary objective of both institutions is to take on the bold task of bringing civil rights and human rights into common focus," HIA Executive Director and Founder Judith Goldstein explains in a prepared statement. Created with a $600,000 grant from the Andrew W. Mellon Foundation, the collaborative new program fits well with the NCCHR's goal of nurturing the seeds of social change, both nationally and internationally, says Deborah Richardson, NCCHR interim chief executive officer. "Humanity in Action has a long history of doing these types of fellowship programs in Europe, but they were very interested in developing a United States-based program in the South, which they've identified as an important region," Richardson says. As a host, the NCCHR looks forward to "using the Center as a backdrop to talk about what social activism looks like in the 21st century," she says. The partnership encourages young scholars to "take on the mantle of social change" by blending their passions and interests with social action, Richardson explains. Before naming the fellowship in honor of Lewis, representatives from both organizations spoke with him to gain his approval, "which was graciously granted," Richardson says. In a prepared statement, Lewis says he was "deeply moved" by the recognition, adding his hope that the fellowships will offer students "encouragement and inspiration to answer the urging within that calls them to take action on the issues of human rights and social justice around the globe — the world needs their commitment to change and their voices." The Emory students are ready for the challenge. "I'm really excited to fill the gaps in my knowledge and continue learning and growing," says Grbic, who has long been drawn to studies focused on the American South. Omar believes the program offers a good fit with his "passion for social justice." "The fellowship's focus on political action to achieve equality fit my aspirations," he says. "I hope the fellowship — and other fellows involved — will aid me in learning how to best address, plan and succeed in initiatives meant to achieve these goals." Sterling was intrigued by the opportunity to pursue "a theme that I find so interesting, which is the relationship between America's majority and minority groups," she says. "And considering the nation's current climate, the seminars and discussions will take on even greater meaning and urgency," she notes. Although the John Lewis Fellowship doesn't mark HIA's first foray into U.S.-based programs, it does offer a unique opportunity, says Anna Nelson-Daniel 12C, HIA coordinator of senior fellow programs and development, and an HIA senior fellow herself. "It's a fruitful place to examine the history of the American South in relation to human rights," Nelson-Daniel notes. "Working with the NCCHR really brings it home." Helping to coordinate the John Lewis Fellowship in its inaugural year is Emory alumna Mia Ozegovic 12C, who was a 2014 HIA fellow. "Atlanta, the epicenter of the civil rights movement, is the perfect place to host this fellowship and examine how history has influenced the present," she says. The appointment of three Emory students as John Lewis Fellows not only represents more scholars than any other university in the program this year, it adds to a growing cohort of HIA participants from Emory — a total of 11 students to date, Nelson-Daniel says. Given the competitive rigor of the blind application process for selecting those fellows, "it's amazing to see that we have three students from Emory," Richardson says. Not-for-profit and non-partisan, HIA launched its first fellowship programs in Copenhagen and Amsterdam in 1999, bringing together college students from Denmark and the United States to explore questions relating to tolerance, diversity and courageous moral choice. Since then, the organization has added fellowships in six countries and has opened applications to students in 10 countries, exploring topics as diverse as the legacies of American slavery, conflict resolution in the Balkans, and contemporary social justice issues in Europe and the United States. HIA received more than 1,000 applications for its six programs this year; less than 6 percent of the applicants were selected as fellows, Ozegovic says.